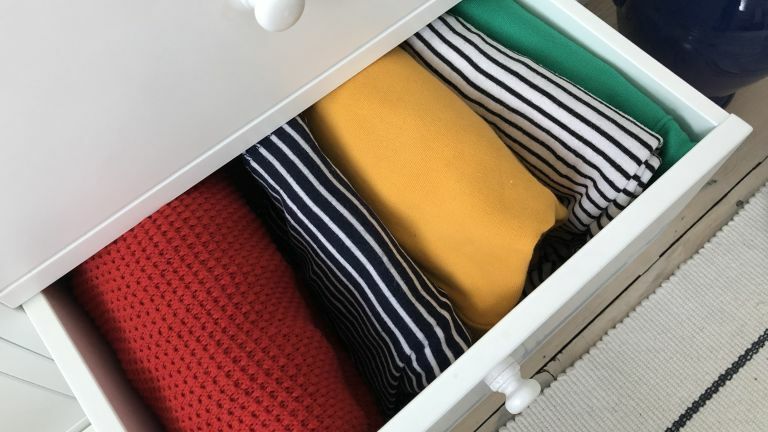 Marie Kondo has ignited a nationwide (possibly global) infatuation with tidying up, with one of her most notable approaches to tidying being how to fold clothes. Instead of folding clothes – let's say T-shirts – and stacking them in drawers one on top of another, which inevitably leads to a) items at the bottom being ignored and forgotten and b) a tangle of clothes created when you do finally rummage towards the bottom of the drawer, she advocates folding clothes so that they can stand vertically on their own and then be placed into drawers as above. The result? You can instantly see everything you own and – amazingly – this method takes up less space. Want to fold clothes like Marie Kondo? Follow our simple step by step to find out how. For more cleaning and tidying tips, hacks and advice, see our hub page. Find out how to declutter and tidy like Marie Kondo in our guide, too. 1. Lay the T-shirt on a flat surface so that it's sideways on to you. Smooth it out – and if you're doing it like Marie Kondo, follow her instructions and 'send love through your palms' as you do so (bear with us). 2. Fold one third of the T-shirt along its length towards the middle of the T-shirt (as above). The fold will be about level with the neckline of the T-shirt. Smooth it down, then fold the sleeve of the T-shirt back over the folded third (think how they do it in posh clothes' shops). 3. Now take the far side of the T-shirt and fold it right back over the third you folded in step 2, so that you cover it completely (see above). Neatly fold the sleeve back over and smooth. 4. Next fold the T-shirt almost in half, leaving the bottom end of the T-shirt showing (as above). 5. Now fold it into thirds to make a neat rectangular shape (as above). It should be able to stand up on its own (see below). You can fold a hoodie just a you would a T-shirt. 1. Lay the hoodie on a flat surface so that it's sideways on to you. Smooth it out. 2. Fold one third of the hoodie along its length towards the middle. The fold will be about level with the neckline of the hoodie. Smooth it down, then fold the long sleeve of the hoodie back towards you, then back down the length of the body (again, think how they do it in posh clothes' shops). 3. Now take the far side of the hoodie and fold it right back over the third you folded in step 2, so that you cover it completely. Neatly fold the sleeve back over and smooth. 4. Next fold the hood down over the body of the hoodie. 5. Now fold it into thirds to make a neat rectangular shape. It should be able to stand up on its own. 1. Lay the trousers, zip down, on a flat surface and fold them in half, lengthways. 2. Now take the bottom of the trouser legs and fold them towards the top so that the hems are level with the top of the back pocket (or thereabouts). 3. Next, fold in thirds, like you did with the T-shirt and hoodie. The jeans should be able to stand up on their own. 1. Lay the socks flat, one on top of the other. 2. Fold them not quite in half, so that the tip of the toe of the sock reaches just a couple of inches shy of the elasticated top of the sock. 3. Fold completely in half again. They may just about stand up on their own – but certainly will stacked vertically in a drawer with all your other socks. You can watch Marie Kondo's tutorial on folding clothes on YouTube. Her books, The Life-Changing Magic of Tidying: A simple, effective way to banish clutter forever and Spark Joy are available on Amazon. See more brilliant storage ideas that we've found below. In the meantime, here's a dog that appreciates Marie Kondo's method of folding clothes. Just because.